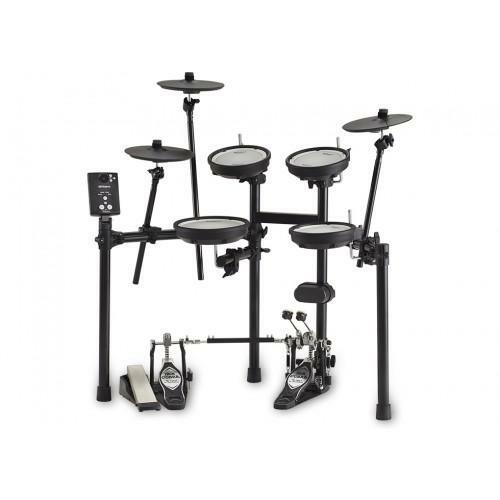 The TD-1DMK provides a fulfilling drumming experience in a compact kit that’s easy to move around. The simple-yet-powerful module includes a variety of expressive drum kits, connected to Roland’s double-mesh pads for snare and toms. These pads use two layers of mesh material for realistic ‘rebound’ (where the drum stick bounces back after hitting the drum), just like on an acoustic kit. Although durable, they’re quiet to play too, and great for late-night practice sessions. You can play with headphones, so you won’t disturb family or neighbours, and with onboard coach functions and the ability to connect to Melodics drum training software, you’ll be surprised how quickly you’ll improve. Pick up the sticks, take a deep breath and pull up to the TD-1DMK. A lifetime of drumming awaits – so what are you waiting for?